A dramatic transformation of global power is under way, one only dimly recognized by most Americans. As economics and trade now loom larger than nuclear stockpiles or Cold War ideology, those countries with the fastest growing economies have begun to rewrite the rules of power and influence in the world. These nations are the Big Emerging Markets, and for too long we have failed to recognize their importance. 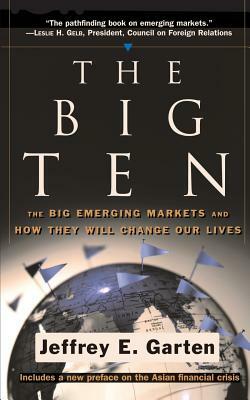 We can no longer afford that luxury.The Big Ten is the essential guide to the ten most important Big Emerging Markets. Jeffrey E. Garten, the Dean of the Yale School of Management and the former Under Secretary of Commerce for International Trade, explains who they are, why they have burst onto the world scene, and how they will reshape the world in the twenty-first century. The ten countries to watch are spread across the globe: Mexico, Brazil, and Argentina in the Americas; China, India, Indonesia, and South Korea in Asia; Poland and Turkey in Europe; and in Africa, South Africa. The Big Ten are bigger than most people realize: they are home to half the world's population, and the United States exports more products to these countries than to Europe and Japan combined. They also wield immense political influence in many of the world's most critical regions. Moreover, American industrial firms, mutual funds, and pension plans have begun to invest heavily in these dynamic economies, making our own prosperity increasingly dependent on theirs.While the Big Ten offer new opportunities for the United States, Garten observes their potential political instability could create economic havoc around the world. In addition, they pose powerful ethical and strategic dilemmas. The BEMs do not share our values regarding human rights, child labor, corruption, or environmental degradation, and our growing contacts with these societies are sure to violate our notions of fairness and our moral sensibilities. And as the Big Ten grow and mature as regional powers, they will pose unprecedented challenges to American global leadership.Drawing on his first-hand experiences at the highest levels of government, finance, and academia, Garten advances a comprehensive plan for America to meet the challenges of this emerging new world. he addresses the critical questions facing American policy makers, business executives, educators, and concerned citizens, and he outlines the bold changes that will be necessary if we are to control our national destiny in the decades to come. The Big Ten will help readers understand the importance of NAFTA, the rise of China, the connection between trade and human rights, and the imperatives for American foreign policy, business, and higher education. Packed with powerful insights and real-life stories from the front lines of international commerce, The Big Ten will redefine the way we think about America's global role in the twenty-first century.